The world is coming to Copenhagen in December for the UN COP15 Climate Conference. The media focus is intensifying the closer we get. About a year ago I wrote a letter to various parties suggesting some good ideas about how Copenhagen and Denmark could profile themselves when the world comes to town. One of the ideas was to provide bicycles for the delegates who will be arriving from all over the planet. Making bicycles available to them, free to use, in order to show them how the bicycle is the ultimate symbol of sustainability and quick and easy transport in the Danish capital. My idea also included recruiting iconic Danish cycling girls to lead pelatons of delegates to and from the conference centre Bellacenter. Sure, it's in December and the weather is chilly, but the symbolic value would be invaluable. I was pleased to learn a few months back that the Foreign Ministry was finally planning to provide bicycles for the delegates. A number of companies and organisations made a bid and two were selected for final negotiations. Both of them were to provide 100 bicycles each, with 100 bicycles each on the back burner if there was demand for them. In the final phases of negotiations, the Danish Cyclists Federation showed up and insisted that electric bikes also be made available. The number of these bikes was 40. It was a must. Period. The reasons are completely beyond me. I can't possibly see why it was of utmost importance for them that 40 electric bicycles simply had to be included. This ultimatum caused one of the companies involved to back out in frustration and bewilderment. They couldn't be bothered with this comedic development. So it was confirmed today that 160 bicycles and 40 electric bikes will be made available to the delegates. Now you get to hear why this is ridiculous. There is expected to be 10,000-15,000 delegates present in Copenhagen for ten days this December. 200 bicycles for 10,000-15,000 delegates. Unbelievable. Add to that the estimated 20,000-45,000 other visitors to the city during COP15. NGO's, the press, activists, et al. Listen... we scrap 400,000 bicycles each year in Denmark. Scrap 'em. Gone. Bye bye. 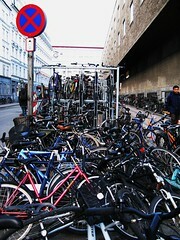 The cities in Denmark are constantly removing bicycles from outside train stations. Many of them are sold at police auctions. Stolen bikes that are later found are given to the insurance company that now owns them. They don't know what to do with them. An organisation like Baisikeli has figured out that they can get a hold of them and send them to workshops in Africa. 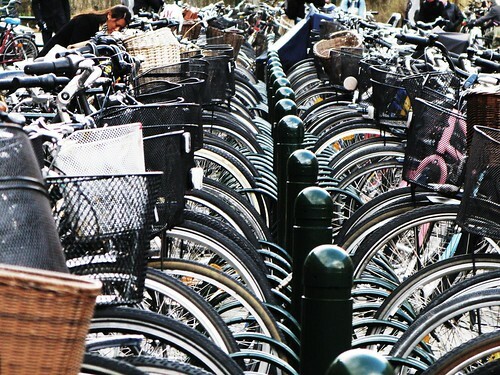 Copenhagen and Denmark could easily provide a few thousand bicycles. Even one bicycle for every delegate if we really put our mind to it. Plus bicycles for the press, the NGO's, the activists. 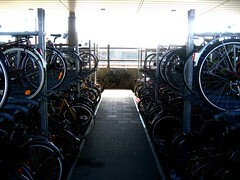 There is no shortage of bicycles. Hell, we could dredge the canals of Copenhagen in one sweep and find bicycles enough for all the delegates from Australasia. Get them fixed up nice. The very first City Bikes in our bike share system were repaired and maintained at the bike shop at one of the prisons in the city. That's just one idea. 200 bicycles for 10,000-15,000 delegates. The marketing value we're going to miss is astronomical. The world's press will show up and not have much to do. They'll cover the opening, a few bits and pieces in between and the signing [hopefully] of the important document at the end. Having just 5,000 bicycles lined up outside the conference centre would not only be a photo opportunity, it would be a most powerful image and lingering symbol of sustainability. "Do as we do. Ride a bicycle. Make a difference." Sure, many of the delegates would pass on the offer. Probably most. But making the bicycles available would send a fabulous message. 200 bicycles. I simply can't get over it. Give the leaders a classic Danish bike each. The many Danish brands could donate bicycles to the event. Personally, I'd love to see Sarkozy on a Christiania bike with Merkel in the box. THAT'S a photo opportunity. But 200 bicycles? 40 of them electric in the one of the flattest capitals in Europe?